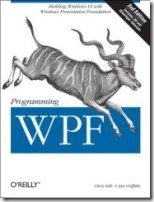 Programming WPF is probably the first book on WPF I ever read (the 1st Edition) and the last one (2nd Edition) I’ll be buying (which is a good thing, since I have 7 WPF-related books now). The first edition was a real treat because there was nothing else available a the time and Chris and Ian really hit some topics (like Databinding) very well – so well that they set the standard for books to come. As each pre-release of WPF came out they dutifully updated the XAML and Framework calls of all the examples from the book. But with the production version of the .NET 3.0 Framework there was so much more that programmers needed to know. Ian took the WPF show on the road and Chris listened to a lot of feedback from the developer community – the results of which really come out in this new edition. The 2nd Edition of Programming WPF comes in strong as the most complete text available on WPF. The authors’ diverse background lead to a great blend of clear and concise writing for a wide variety of topics. The introductory chapters are great for beginners just getting into the topic, but there is also a great deal of detail in the advanced chapters to get you well into topics such as: handling graphics, bitmaps, databinding (templates and stying), animations, 3D, text and flow documents, and more. I like the way they take typically hard topics (e.g. Control Templates) and go deep with concrete examples and helpful code/apps like “Show Me The Template!” from Chapter 9. They also show that they understand “real programming” environments when they don’t just gloss over issues such as the interoperability of WPF and Windows Forms (which isn’t a stretch because they’ve written on Windows Forms as well). A “taste of Silverlight” left me wanting more – maybe they’ll come together for a Silverlight book once 2.0 ships? The color section in the middle was helpful but awkward as you read through it when you get to the center of the book and see color versions of pictures you are already past and glimpse pictures of what is to come. I applaud the inclusion of only 32 pages of basic XAML syntax – enough to give you an understanding of the language but not so much as to take over the book (some books can end up being 1/3 to 1/2 syntax and framework references, which is why you install the MSDN Library and Intellisense). I wanted to see something about Expression Blend or even Design as these tools become important when doing good UI design, but at 800+ pages already there really isn’t room (and I don’t know what I would have cut to make room). 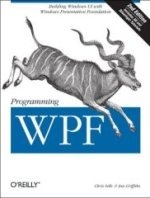 While several of the other WPF books have been good to read through and learn from, I can see the Programming WPF book being one that will become a reference book to return to when you have need for a certain feature of WPF.